This is a great technique to dress up plain-ish beads. 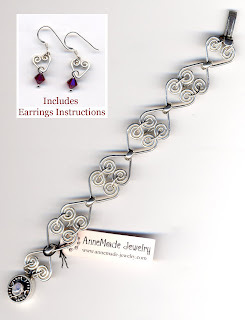 The tutorial also includes detailed instructions on making wrapped loops. 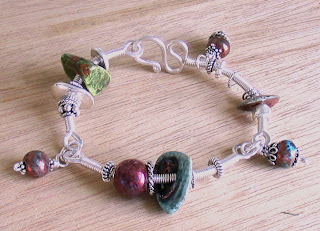 A jointed bangle featuring floating beads, dangles, coiled wire, and a squiggle hook clasp. Work on your open spirals with this not-too-cutesy heart link. Two lightweight and comfortable bracelets and coordinating earrings. I’m not really into hearts, but I like these because of the spirals. Oh, and I guess the Swarovski Puffy Heart pattern is an okay heart because of all the sparkles. I saw those pendants for sale in Old Town Alexandria over the weekend for $92. Sheesh. Coming up… a square/diamond pattern similar to the Puffy Heart Pendant. As if you needed a way to use those beautiful crystals! Previous post: See? They are evil.